If your opponent negates the Normal or Special Summon of a monster(s) or the activation of a card or effect: Destroy all cards your opponent controls and in their hand. Condemned Witch and the man from the Solemn series appears in this card's artwork. 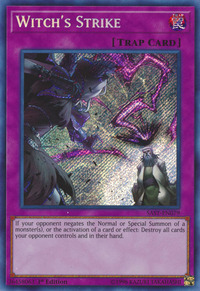 This card's artwork mimics, and appears to be a continuation of, the events depicted in Solemn Strike. Oddly, despite this card being a member of the Solemn series, this card cannot be used against any of the Counter Traps within the archetype, nor Ultimate Providence, as this is a Normal Trap. Furthermore, this card can't be used against Solemn Authority either as despite it being a Continuous Trap, it supports the Aesir archetype and does not have effects that involve negations.